Are you a gagger?? No worries, we'll take care of that. Introducing a 3D scanner which replaces the need for traditional impressions/molds. 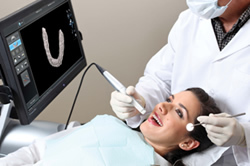 Cavalier Orthodontics is the first practice in the area to add a 3D impression scanner. This state of the art technology is a highly accurate, flexible digital solution system which greatly improves your experience. 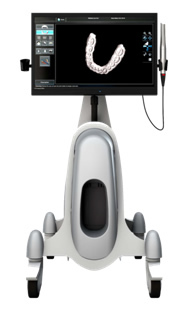 Cavalier Orthodontics is now providing a better patient experience and better oral care through digital technology, the 3D impression scanner â€”a complete digital impression system that uses 3D-in-motion video technology to deliver a true replica of a patient's teeth and gums with precision and accuracy. The digital process brings a better patient experience, improved productivity, and ultimately better oral care. Every patient at Cavalier Orthodontics can benefit from the scanner. This cutting edge technology will greatly reduce the need of traditional style molds. Come see the "Cavalier Difference" for yourself! We use the best orthodontic appliances available and as a result, we can spread out your appointments from 4 to 8 weeks instead of monthly visits, which was standard only a few years ago. In addition, your child will miss less school and you'll lose fewer hours from work due to great flexibility provided by the advanced equipment. The advanced equipment also reduces discomfort to the patients. This occurs because the latest wires exert a low, constant force, which has been desired by orthodontists, but still deliver the same results as the stronger, traditional stainless steel wires. As we are here to serve you, during your stay we want to keep you as comfortable as possible, inconvenience you the least and provide you with the best possible outcome.